This weekend the Sarah Lawrence community will be celebrating Women's History Month with our 13th Annual Women's History Month Conference, Breaking Boundaries: Body Politics & the Dynamics of Difference. Friday, the conference opens with a plenary featuring Marilyn Wann (author of Fat! So?) 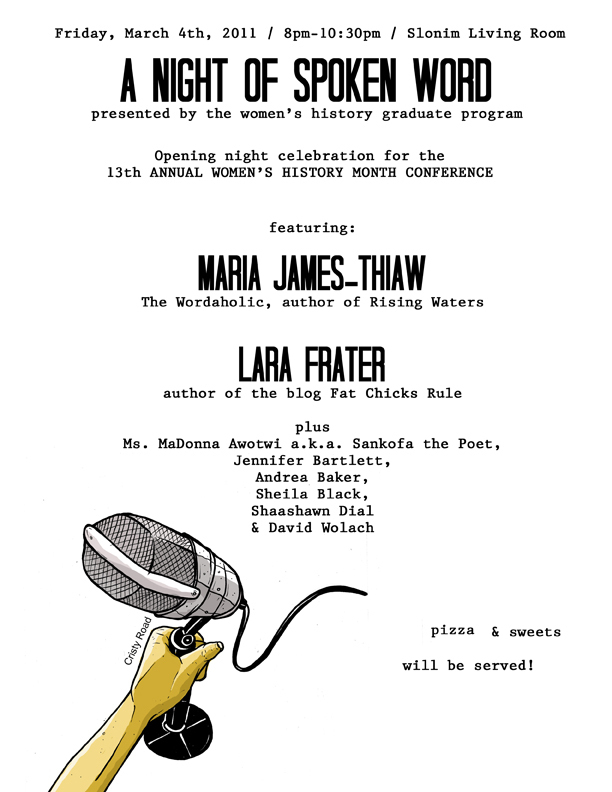 then a Night of Spoken Word featuring Maria James-Thiaw and Lara Frater, plus other artists: Ms. MaDonna Awotwi a.k.a. Sankofa the Poet, Jennifer Bartlett, Andrea Baker, Sheila Black, Shaashawn Dial, & David Wolach. A full conference schedule can be found here. I'll be helping with the conference this weekend (along with fellow R/V staffer Thea Michailides) so I really hope to see you there! Excited about it all.